I know it’s been over 2 months since I’ve posted anything. I’ve been very busy in actively pursuing a career in Information Technology. I don’t want things to get too personal, but things have become bumpy and unpredictable and I had to slowly adapt to the situation. Because of this, the blog has been silent for a while. With that aside, I’d like to let you know that there have been a lot of things popping up on the internet that has a connection to Toys for Bob or Star Control. I hope to write about them soon. So, stay tuned and I hope people still use RSS readers and get this. Star Controller is now 3! I know it’s four days late to announce this. Star Controller is now three years old. Coincidentally, this is also my 200th post. One thing that’s been notable this year is the fact that we now know that Toys for Bob’s current project is Skylanders: Spyro’s Adventure and they have been concentrating on the Wii version while the other versions are being worked on by other developers. From what I’ve read, TFB had strong creative control over how they designed this game; they even considered a darker version of Spyro. It’s nice to see it’s not a movie-licensed game this time. The official release date has been announced and it will be available October 16 2011. It makes me even more curious about what TFB’s next project will be; it could be a Skylanders sequel or something else that is completely unexpected. I still think about Star Control and at the same time, I’m just as eager to see what TFB can pull out of their magical genius hats. Anyways, I just wanted to keep this nice and short. I’m curious to see what will happen in the future and I hope to see lots of good news in the future. Star Control 1 & 2 was released as part of GOG's "New wave of Atari games"
I just logged into my computer yesterday and saw various tweets and articles about how Star Control 1 and 2 were both available on GOG.com for $5.99. It was one heck of a surprise. The extra items available after purchase include the manuals of both games, guides and maps for Star Control 2. There is also a soundtrack which includes audio of the intro from the 3DO version of the second game. Most of the stuff I glanced over, is available for free. However, it’s nice to see everything in one spot without having to “google” everything. I remember reading a forum thread about getting Star Control on GOG and I initially thought it wouldn’t happen due to the legal technicalities between Toys for Bob and Atari. After all, Atari owns the title; TFB owns the most important part of any video game, the content itself. I sent an e-mail to Paul and Fred about what they think about this addition to GOG. They informed me that “Atari’s right to publish these games expired years ago” and they were not contacted before the game was added. They’re not getting their share of the profits. In addition, Paul said that he made an attempt to contact GOG about this and hopefully resolve this. I bought the game to see what the extras were like. I think GOG’s a great service; hundreds of games available for low prices, better compatibility, DRM-free and beautifully packaged. I bought many games from them. I feel a little guilty about buying the Star Control pack and I really hope that TFB can turn this around in their favor. In conclusion, it’s nice to see that the news about Star Control on GOG is spreading around. I think Matt Barton’s interview had some kind of influence. I think this is an interesting coincidence; 9 days after Matt Barton’s final part of the interview with Paul Reiche and Fred Ford, GOG surprises us with Star Control. I wasn’t sure if TFB was getting their cut of the profits and I was even more surprised that Atari didn’t even have the rights to publish this in the first place. I wish TFB the best of luck and I hope this turns around in their favor. I’d also like to thank the reviews on GOG that mention The Ur-Quan Masters; it really means a lot to the Star Control community. I remember wanting to write about the first bundle and I was so busy with work and I didn’t have much time to go to my blog and write. In a nutshell, the humble bundle gives players the chance to pay any amount they choose (minimum $1), decide where the money goes and receive a link to download all 5 games for Windows, Mac OS X and Linux. The humble bundle will continue for the remainder of this week; the website has a counter on the top of the page. The two games that are currently in progress, Cortex Command and Revenge of the Titans, their betas can still be downloaded. When the games are updated or completed, the versions on the humble bundle will be updated. When $1 million was raised with the last humble bundle, source code for Gish, Lugaru, Aquaria and Penumbra: Overture were released. For this humble bundle, John Graham (president of Wolfire Games) did not make any statements whether or not anything will happen if this bundle should reach $1 million like the first one. Actually, John kept a lot of secrets about his plans on the bundle. He did mention that he has considered getting Minecraft into the humble bundle. Please support the Humble Indie Bundle. Pay $1 or more, decide where the money goes and get 5 cross-platform games with no DRM. As of this post, they have raised over $795, 000 with only 4 more days remaining. 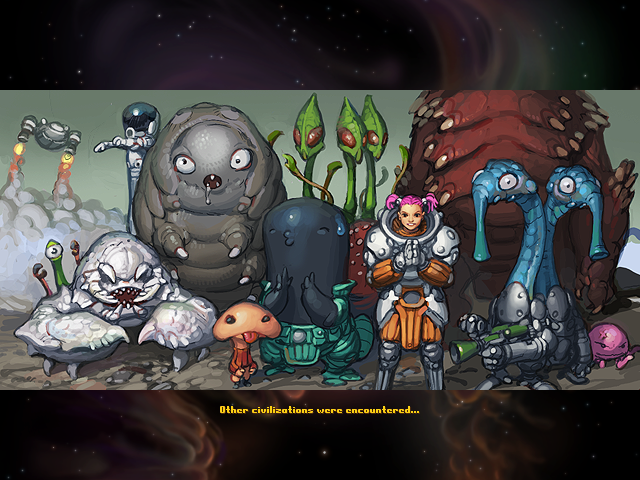 Support indie developers and check out Cortex Command and Arne’s artwork. EDIT: Minor correction. Source code for 4 of the 5 games for the last humble indie bundle were released by the developers. It’s been a while! We’re still working on a game that we think is really awesome and fun, but we can’t talk about it just yet. We would, however, like to clear-up some rumors that have been circulating about a new Star Control game we’re supposedly making called “Above and Beyond”: they aren’t true! The game we’re currently developing has nothing to do with Star Control, but it’s still really exciting and we can’t wait until we can talk about it officially. Stay tuned! I can’t wait to see what kind of awesome and fun things they have put together in their new video game. Glad to see that it’s not Above and Beyond. I always assumed it was a rumor and at least it threw TFB in the spotlight for a brief moment. We still have another TFB mystery in our hands and it’s great to hear TFB reiterate that it is awesome, fun and exciting. It’s so awesome, fun and exciting, that they were given extra time to polish it and make more changes. Needless to say, Lukipela wrote a very engaging article about his chat with Paul. It’s a must-read for everyone! Nicely done, Lukipela. With regards to the RSS parser I made, I’ll have to add some extra exception handling to deal with some things I didn’t expect. Whatever they are working on, I hope it leads them on a path to creating more awesome, exciting and fun games that they have control over. Comments Off on Quick TFB News Update! There has been some news that has popped up today regarding an unannounced game from Activision-Blizzard. It is called “Above and Beyond”. As of this writing, the only information about this game is from an Australian classification board. The information given is that it has been given a mature rating and listed as “computer games (multi-platform)”. Superannuation was the first site to post this discovery. Please keep in mind that the ESRB does not have “Above and Beyond” listed as of this writing. The criteria between Australia and North America ratings can be different. The words “mature” and “violence” does not necessarily mean it will be a bloody game with excessive profanity. The Australian Classification board has a separate MA 15+ rating for “Strong coarse language”, “strong violence”, “blood and gore” and “strong horror violence”. Some blogs have even linked back to an article I wrote back in October about Shaba Games closing down. I wrote to Alex Ness about it because a few years ago, he told me that some employees at Shaba supported the idea of a new Star Control game. With the announcement of Shaba closing, Alex said that some of the people they hired previously worked at Shaba and their team is starting to grow. Alex also gave another small hint that their unannounced game will “feel more classic Toys for Bob”. I have no idea if Above and Beyond is TFB’s new game. 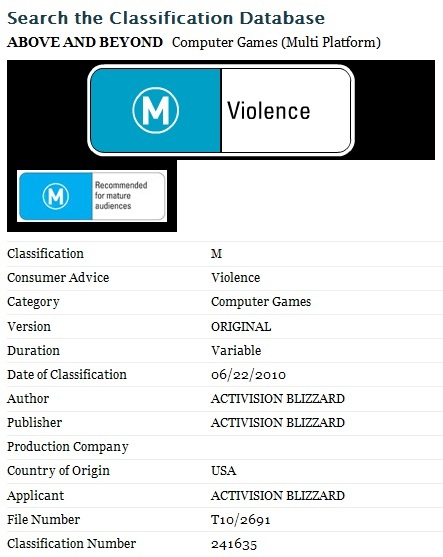 There really isn’t much information given other than the Australian Classification board rated it “mature”, author and publisher is Activision-Blizzard and it wasn’t in this year’s E3 convention. If more details emerge about this game, I’m not quite sure how the ESRB will evaluate it. From the above image alone, there is nothing to suggest that it has ties to Star Control or Toys for Bob. It’s a game title nobody knows about from a giant third-party publisher. Overall, I’m glad that speculation towards TFB’s secret project and Star Control is spreading quickly through different video game sites. Sooner or later, there will be more news about this game and hopefully things will be clearer. After seeing so many E3 videos, it’s obvious this year will be another interesting one for video games. Just because it wasn’t in E3, doesn’t mean that we won’t hear more about this game in the future. Voting has ended for PC Gamer Top 100. It will be a month or 2 until we see the results. We missed Paul Reiche’s birthday. It was on February 17 and it is the same birthday as Paris Hilton and Michael Jordan. I wanted to integrate Twitter into the blog. I have a twitter page (@starcontroller). So does Paul Reiche (@PaulReiche3), Arianna Reiche (@ariannareiche) and Chad from Star-Control.com (@chadjd). I do update my Twitter account occasionally and I hope to make better use of it in the future. If you have Twitter, please follow us. With talk of downloadable characters in Sonic & Sega All-Stars Racing, there’s a very strong demand for ToeJam & Earl. These characters and their game were created by Greg Johnson, a longtime friend of Paul. Sega wants to use these characters without paying Greg, which is ridiculous. Can you imagine if Hideo Kojima didn’t get paid for having Solid Snake in Super Smash Bros. Brawl? I have recently learned that Greg did not get paid for the Virtual Console port of ToeJam & Earl due to legal complications. I feel very bad about these things and I hope that Greg gets paid fairly for it if Sega wants to use his characters. After all, it is one of the most popular and unique games on the Genesis. He deserves respect and payment for it! There are some things about the birth of The Ur-Quan Masters that I’d like to write about and might interest people. Did you know that Crystal Dynamics had a demo disc for the 3DO called “Sample This!”? It included The Horde and Star Control II along with a few others. Have you heard about the senior employee terminations at Infinity Ward? There is an issue with royalty payments from the stellar success of Modern Warfare 2. What does this have to do with TFB? First of all, it’s an example that no video game developer is immune to the recession, legal technicalities and there are no measurable trends to predict these things. I respect Infinity Ward and whenever I think about TFB, they are one of the few developers that made one of my favorite childhood games and still active in the industry. TFB does a great job at keeping their plates full with projects, satisfying their publishers and respects their fanbase as if there were 50 million of us. Star Control has been mentioned in various Mass Effect 2 reviews. Some people have even gone as far as to compare the way ships travel in both games. I haven’t played ME2 yet and I hope to get it soon to see for myself.